THIS IS IMMENSE! Its over-whelming complexity resembles “rammed through” legislation for CSKT Water Compact and Obama Health Care plan. This Trans-Pacific Partnership, TPP initiative, is not a free-trade deal, but total integration and convergence of the European Union and U.S. Trans-Atlantic Partnership network. While influencing about 40% of the world’s economy, it would provide international powers over lives and national sovereignties world-wide. This legislation paves the way for ultimate globalization of the New World Order. TPP segments merging with the Euro model consummate UN central control objectives. This may be the culmination and launching of the global financial and economic plan. Our U.S. Federal Agencies have paved the way by unconstitutionally ignoring legislative process and authority. They appear more accountable to the Executive Branch than to Congress or American citizens. Bureaucratic rules and regulations assume power of law complete with enforcement. Claims of environmental protection over-ride national interests although both could be simultaneously accommodated. Through bureaucracy TPP could become an entirely new regulatory and legal structure applied globally. – People/Population Control: Universal health care plan with control over birth, life, death. – Water/Land Control: Necessity of all life. Elimination of private property; govt. land and use management. – Food Control: Sources, availability and production; over-regulated commercial operations. – Economy: Corporate exodus of manufacturing, lock-down of natural resources, job loss. This umbrella plan was 6 years in the making behind “closed door” secrecy. Fragmented, controlled viewing by Congress with inadequate review time assures confusion and lack of comprehension of the entire program, its significance and threat. If passed, its piece-meal composition will complicate modifications or even total cancelation if deemed necessary. Attempts to remove it would not assure dismantling of component parts. The Obama administration and its voters have basically assumed responsibility for a program that will impact world commerce and global economies “FOREVER”. Foreign leaders likely had little input in this American-created monstrosity with long-term international ramifications for governments and human populations. It is a living, open-ended, document, subject to ongoing changes by non-elected individuals far removed from input by countries and populations being impacted. 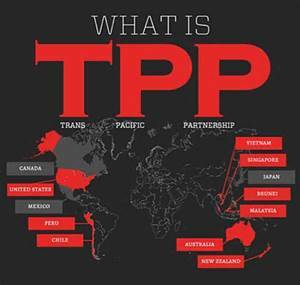 TPP Trans Pacific Partnership – An agreement between 12 pacific Rim Asian nations – replacing individual trade negotiations between countries. TAA Trade Adjustment Assistance – Job compensations for negative local repercussions. TTIP Trans-Atlantic Trade and Investment Partnership – Loss of sovereignty/independence. Conflict resolution courts over-rule national, state and local laws. International elites may provide Corporate exemptions. TPPC Trans-Pacific Partnership Commission by-passing Congress – Multi-foreign bureaucracy of policy-making, regulatory planners: labor, labor mobility, immigration (Trojan horse), commercial with control over jobs, wages, sovereignty. This program was likely deliberately designed to be an administrative and legal quagmire, weakening sovereignty of nations, facilitating totalitarian rule enforced by a world court. It must be killed NOW. American citizens must contact Congressmen (House and Senate) requesting NO vote to defeat this MONSTER ON THE MOVE! so basically this is legalization of the public private partnership they have been doing all along. now they are only putting down in writting now as if somehow that legitimizes it or something. wicked people do as they do and they care not about law otherwise they would not be wicked.